A look at the evening news in the last couple weeks offers a deluge of natural disasters – hurricanes pummeling the Caribbean and southern coasts of the United States, earthquakes in Mexico and Los Angeles, and wild fires burning in the Northwest. It’s imperative that we do all we can to mitigate these dangerous effects of climate change. In the Northeast, states are serious about addressing these types of potential disasters through aggressive carbon reduction goals – to the tune of a 75-80 percent reduction by 2050 – and they are making progress on those goals. To reduce carbon emissions on a regional scale, however, a major shift in energy use behaviors across our region must be fast-tracked in a cost-effective way. Greasing the wheels on this path away from fossil fuels requires a fresh view of energy efficiency, and a new understanding of its important role in realizing a smart energy future that is economic, clean, and distributed. Indeed, this path includes a dramatic shift of energy uses to electricity, while also making them more efficient. This is a key part of deep carbon reduction. NEEP’s Strategic Electrification Project is designed to assist our region with assessing opportunities for deep carbon reduction, providing actionable steps forward, and convening stakeholders for collaborative learning occasions. To that end, we recently published a report titled Northeastern Regional Assessment of Strategic Electrification to define strategic electrification and examine the potential of this carbon-reduction strategy. According to NEEP’s definition, strategic electrification is powering end uses with electricity instead of fossil fuels in a way that increases energy efficiency and reduces pollution, while lowering costs to customers and society, as a part of an integrated approach to deep decarbonization. So, let’s break it down further. 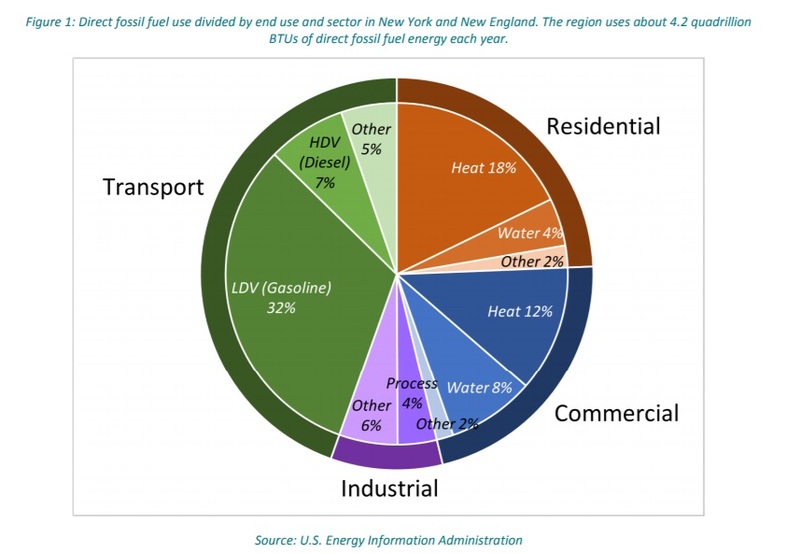 In New England and New York, direct fossil fuel use adds up to 4.2 quadrillion BTUs per year, which is the equivalent of a pile of coal 10 feet thick by one mile wide by 3.3 miles long. Seems insurmountable, doesn’t it? The good news is that 85 percent of this fossil fuel use is addressable with electrification technologies like air source heat pumps, variant refrigerant flow systems, and electric vehicles, among other things. Most electrification will occur through very large shifts to just a few electric technologies like electric vehicles (the most familiar) and variations of air source heat pumps for heating and water heaters. Many of these technologies are already in the market. Now, we’ve got to speed up the process of making them commonplace. The good news is that NEEP is working on a regional action plan with guidance on how to back out of reliance on carbon-based fuels by switching to super-efficient heat pumps, electric vehicles, and other energy saving electric technologies. The goal of this five year action plan is to jump start the electrification market into higher gear. Aggressively ramping up these new technologies should include an understanding of all possible benefits (lower pollution, more convenience, less noise, local jobs, improved national security, and so on) as we address our energy needs in a more holistic way. Switching the fuels we use every day seems like a big deal, but hopefully this action plan will offer some thoughts on how we might get there. Many suggestions will focus on regional activity centered on policy and programs that highlight strategies such as mandates and targets, market development, and education. NEEP is committed to this re-framing of energy efficiency’s role to meet regional needs for reliable and affordable clean energy in a carbon-constrained world. We’re committed to a shared regional goal of reducing carbon emissions 80% by 2050. We’re committed to a world with fewer devastating weather events.